It appears one of the biggest trash talkers in mixed martial arts has a bit of explaining to do. 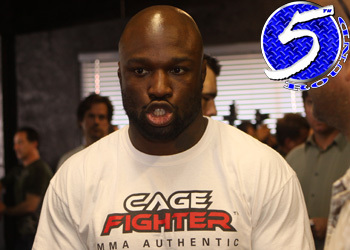 On Tuesday morning, the Nevada State Athletic Commission reported Strikeforce light heavyweight Muhammed “King Mo” Lawal (Pictured) had tested positive for drostanolone. Lawal handed Lorenz Larkin his first professional blemish on January 7th at “Strikeforce: Rockhold vs. Jardine” with a resounding 2ndRound knockout. Drostanolone, also known as Masteron, is a powerful anabolic steroid that is typically used by bodybuilders as a bulking and cutting agent. Hermes Franca, Dennis Hallman and Josh Barnett have all been busted for the same drug in the past. Lawal has denied his use of the substance with multiple news outlets. All of the other fighters that were required to participate in drug screenings for the event passed their exams. Barring a successful appeal, the former Strikeforce champion faces a year-long suspension, $2,500 fine and having his victory overturned to a no contest. “Strikeforce: Rockhold vs. Jardine” took place inside The Joint at Hard Rock Hotel & Casino in Las Vegas.